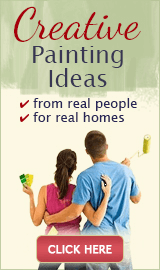 Although the striping paint technique is very popular, it's usually reserved for the walls only - but why always limit your painting creativity to the same one surface? 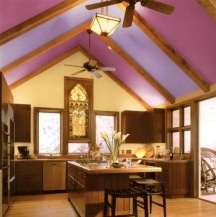 Perhaps the most unconventional painting idea is striping paint on a ceiling, of all places! But don't you love the funky, jewel-box effect it creates? 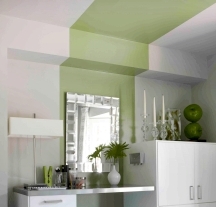 Of course, the stripes will also make the ceiling seem lower, so only use this idea in rooms that can handle it. Unlike many other decorative ceiling painting ideas, stripes do not require tray or dome ceilings, but usually look better when finished off with simple crown trim. 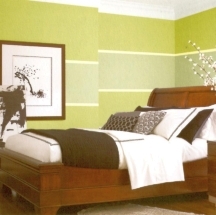 Make sure at least one of the stripe colors is related to something already present in your decor (it also works great when the lightest stripe color is the same as, or very close to the wall color). To ground the ceiling even more, "drag" the stripes down the walls a bit, to create a cap-like shape. 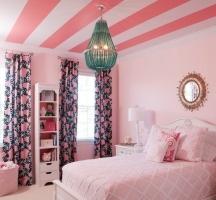 Or you can even wrap the entire room in stripes - start by striping the walls, and then continue all the way up across the ceiling in the same pattern and color combination. Another challenge with paint striping ceilings is the literal pain in the neck from all that measuring, guide line marking and taping. But of course, you can always cheat and use super-wide blocks of color - just 3 stripes, or even one statement stripe - and you'll be done in no time! 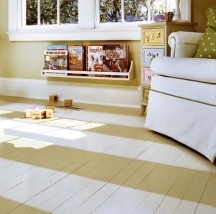 If you have old wooden floors in your home that can be painted, consider stripes - you will create that cool, designer look that you usually see only in home decorating magazines. And it's very simple to do with boarded floors because there is no need to mark or tape anything off - simply follow the direction of the planks when painting. But you are not limited by the material of your flooring - with the right surface preparation and products, you can paint even over tile, linoleum, parquet or concrete. In addition to looking stylish, this stripe painting idea also lets you manipulate the dimensions of a room - for example, floor stripes painted across a room will make it look wider, while those done vertically will visually elongate it. You can use this effect to your advantage by planning the direction of the stripe pattern strategically, so that it will correct or balance the shape of the room (instead of exaggerating any existing imbalance). 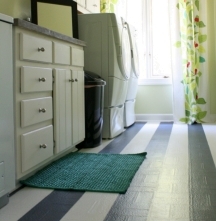 And finally, you don't have to paint stripes all over the floor, corner to corner - sometimes it makes more sense to only paint a striped "rug" in the middle of the room (for example, under your breakfast or dinner table). 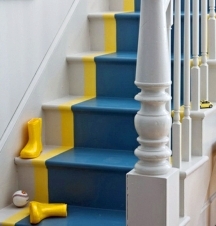 Paint striping also works beautifully on stairs, where it can be done vertically or horizontally. 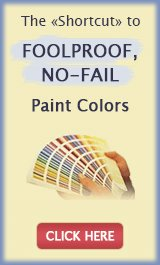 One idea that is always successful and easy to do is to paint a "runner" on your staircase - it can be as simple as a single wide block of color, or as complex as a striping combination in multiple colors and sizes. The stripes in the "runner" can be symmetrical or irregular, painted along or across the stairs, and adapted to work for any decorating style - from traditional to minimalist and everything in between. 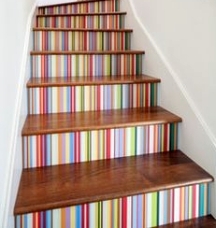 Another interesting idea is to only stripe the risers (the vertical boards) - this works great with the steps painted a solid color, as well as with stained tops. 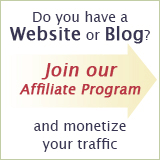 These stripes can also go in any direction, and the pattern can look as basic or as complicated as you like. Wider stripes will require taping as usual, while for thinner sizes you'll either have to use a comb (for 2-color combinations) or lots of time, tape and patience (if you want to create multi-color pinstripes). 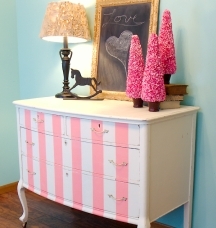 Do you have an old dresser that's been sitting in your garage or self-storage? The one you can't throw out because it belonged to your grandmother, but that you don't want to bring inside either because it just doesn't fit with your home decor style? Or maybe you've found a new-to-you yard sale treasure of a chest that looks solid but a bit too shabby to pull off as is, and you are not afraid to experiment on it with paint because it only cost you a few dollars? 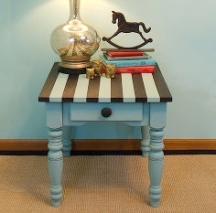 Stripe painting offers a great way to resurrect a forgotten piece of furniture and turn a boring flea market find into a conversation object. It's also how you can add some pizzazz to a room without having to paint the walls - a good solution for renters who want to personalize their space but are not allowed to paint. The striping technique is versatile it can be done on cupboards, chairs, bookcases, headboards and tables, and can look as playful or as serious as you like - just change the paint colors, tweak the pattern and the size of the stripes, and it will look appropriate on kids' as well as on adults' furnishings. Finally, here's a really smart idea for striping paint on the walls: creating a single-stripe border around the perimeter of the room, or even just on 1-2 select walls. Such painted borders are very fast and easy to do - it's usually a fun afternoon project. But don't underestimate their decorative impact - they can add interest to a plain room, create a sense of more structure and shape, and imitate wall trim where none is installed. The stripe can be a glossy white (if you want it to look like a chair rail or crown molding), done in a complementing color that is tied to your room color scheme, or a variation of the wall color (important if you want the effect to look coordinated). In contemporary or whimsical decors, you can even paint the band by hand - for a charming, less-than-perfect, and even somewhat innocent look. And of course, you can always further embellish the stripe with stamps, stencils or hand-painted designs if it looks too plain to you unadorned (or to add some cute touches in nurseries and kids' rooms).